Gilwern Primary School near Abergavenny has successfully achieved the Healthy Schools National Quality Award – a Welsh Government scheme managed by Public Health Wales. It is only the third primary school in Monmouthshire to win this accreditation. The Healthy Schools National Quality Award is an excellence award for health promotion in schools. To gain the award, staff and pupils developed a whole school approach to food and fitness, mental and emotional health and wellbeing, personal development and relationships, substance use and misuse, environment, safety and hygiene. These health topic areas are embedded within the curriculum and reinforced through extra-curricular activities, pupil groups and links with local community groups and partners. The ethos and organisation of the school demonstrates unity and care. Staff are friendly, approachable and excellent teamwork is supported by the governing body as well as parents and carers. Pupils’ involvement in decision-making receives high priority with a number of active pupil groups that support and develop key health promotion messages. Pupils have the opportunity to take part in a variety of local community events and sporting tournaments. Children’s rights are fundamental to the ethos of the school as well as strong international links and involvement with the Eco Schools programme which have contributed to achieving the award. Staff and pupils from three schools; Italy, Bulgaria, and the Basque region of Spain are involved along with ourselves in the promotion of sustainable life styles. Staff and Governors from Gilwern have previously travelled to Taranto in Italy and Bilbao in Spain, with a future trip to Bulgaria being planned. Our guests have been staying in the Gilwern Outdoor Education Centre and have had the opportunity to enjoy our wonderful countryside with outdoor activities and a walk on the Blorenge. They have also experienced Welsh culture; with a visit to Cardiff, a trip to Big Pit and a visit to a local sustainable property. 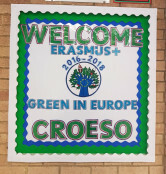 Gilwern School would like to welcome our visitors from our Erasmus project. Over the weekend we have seen our visitors arrive from Italy, Bulgaria and the Basque Country.